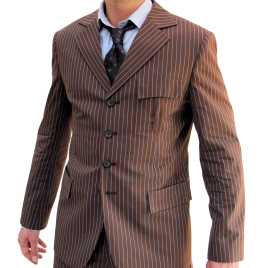 I've ordered two of these suits, one in custom cotton brown, the other in a custom fabric selection. I'll be ordering another. Ever get tired of suits that limit you to only having the pant pockets to put car keys and other things in? This suit has 11 pockets! Not to mention my girlfriends pupils dilated to the rims when she saw me wearing this. The craftsmanship and attention to detail are on par with that of any high end suit, and for the price as well as getting them quality custom tailored; you really can't beat it. I wish all suits were made this well and am glad that it's the perfect marriage of form and function. Hard to find but definitely worth the buy.